Are you struggling to create new and unique content every day, every week, or even every month? Have you worked hard at producing a blog, but still feel stuck? In a previous post, we shared The Ugly Truth About Blogging. It was amazing to find that I’m not the only one blogging out there who understands how ugly blogging can get. Many of you shared in that feeling. Part of the ugly truth is that even while time consuming and frustrating, blogging is so worth it. Whether your goal is to make money, reach out to clients, or add a personal touch, your blog can do all that and more. One of our readers agreed with the frustration blogging can bring and wondered if we can just repost articles to help save on time and energy. That same day, I was reading an article on my favorite blog and realized that some of the content looked familiar. In fact, I could have sworn I saw that picture before. Now I wish I could confess that I was reading a really cool, electric blog about blogging, but I wasn’t. I was reading a mom’s blog, in fact it’s called Money Saving Mom. Yes, it’s about being frugal and living life on a Husband in Grad School kind of budget. What the author had done is something I do fairly often on the blogs I ghost write for. She revamped her previously written content. To answer the reader’s question, simply republishing a previously written article can be done, but we wouldn’t recommend it. It is well known that Google favors unique and fresh content, and that is why we don’t recommend it. What we do recommend, to save time, energy and words, is to revamp. This means taking an article that was previously published and putting a new spin on it. 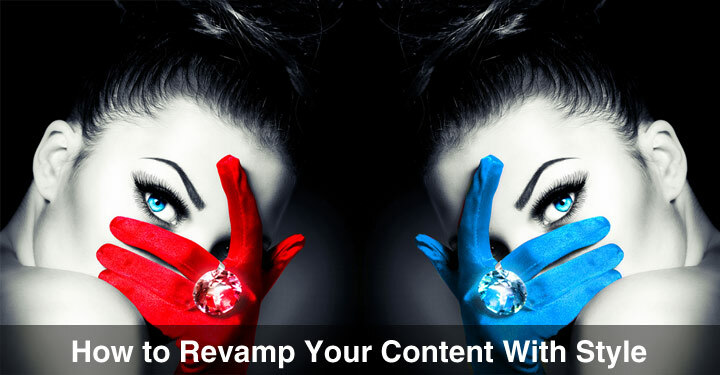 In my mind, revamping is similar to curating content except that you are curating your own content. Take a second to look back on some of your most popular articles and see if you can spin that article in another way. When I have written a lot about one topic, I will create a basic 101 article for that topic. I will link back to each article and write and completely new summary of that article. This is also creating a really great cornerstone piece. Turn your previously written content in to an infographic. You already have the information waiting for you and with 60% of people being visual learners, your readers will love it. When Rebekah Radice wrote a guest blog for Peg Fitzpatrick, Boost your Blog IQ by Repurposing Content, she made an excellent suggestion that works great for revamping as well. Rebekah wrote about doing a follow-up post. I have found that revamping articles works mainly because I revamp only what appears to be the most popular articles. Revamping also saves on time, energy and honestly, the words seem to come easily when you have already written about the topic. Do you ever revamp your articles? What is your favorite way to revamp them? Please share your thoughts in the comments below. If you haven’t already subscribed to our blog, please don’t forget to do so. While this week we dug deep into revamping, you won’t want to miss our post on purposing. Find out the answers to questions like, What is the difference? and How to repurpose with a purpose at: How to Repurpose and Recharge Your Content. Thank you for putting this information together Christine. My favourite suggestion is the follow up post. You are right about the words flowing with ease the second or third time round. It’s also the motivation from a successful post that leads you to dig deeper into the subject. Pinning on my Blogging board and sharing across social channels. Another great read! Would you care to share any tips or resources on creating good infographics? Is there particular software that you suggest using? I agree with this being a way to “extend” the life of content. Glad to see this topic being discussed. Great question! There are many online infographic makers available. One free one that I have used is Piktochart (piktochart.com). I’ve also tried Visme (my.visme.co) and Canva (canva.com). Thank you for stopping by and if you do get a chance to try an online infographic maker, I would love to hear what you think. Thanks for the infographic tool list. I haven’t tried one yet and I should. You are very welcome! I would love to hear what you think if/when you have the chance to create an infographic.